Almost 50 shots in 40 minutes were made. The Russian occupying were firing with tanks for 40 minutes near the Hnutove checkpoint on the line of contact in Donbas on the morning of 21 April, the antiterrorist operation (ATO) HQ press centre has said. 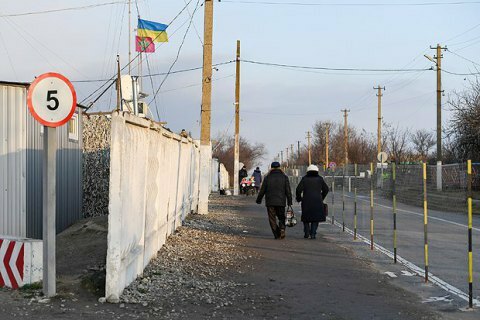 "Because of a shooting attack by militants of the Russian occupying troops with the use of tank weapons against the ATO positions near Pyshchevyk and Pavlopil, the Hnutove checkpoint located in the area stopped processing citizens for some time. Civilians, who were near the checkpoint, were taken to safety," the press centre said. The enemy attack lasted for about 40 minutes. During this time, the enemy made almost 50 shots. The militants also used banned 120-mm mortars, having released around 60 bombs. The ATO HQ said that yet another attack using the weapons banned by the Minsk agreements confirms that militant chieftains were not interesting in stabilizing and settling the conflict. According to the UN, over 2,540 civilians have been killed in Donbas over four years.